The Israeli press is definitely not the best place to get reliable updates on the situation/crisis in the Palestinian Authority…. but surprisingly I found this following article on HaAretz’s site a few minutes ago. It appears to be factual and hopefully might answer some questions that people have about where Abbas is and why… In the meantime, the only victors in the present crisis are the Israelis… unity can lead to recognition… recognition can lead to statehood. Palestinian Authority Chairman Mahmoud Abbas has reached one of the most important crossroads in his life. On Monday, he found himself in a bitter struggle with the head of the opposition in Fatah, Farouk Kaddoumi, and two of his supporters during the preparations for a meeting of the movement’s central committee in Amman. 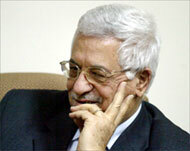 Abbas did not get the support he expected from his colleagues on the committee. The situation was so bad that the gathering was canceled – though officially, it was merely postponed for a week. Aides to Abbas suspect that Kaddoumi is cooperating with Khaled Meshal, the head of Hamas’ political bureau, who is based in Damascus, and that the two are making a bid to take over the Palestine Liberation Organization and move the Palestinian leadership out of the territories. Thus Abbas now finds himself embroiled in infighting and tension not only with Hamas, but also inside his own movement. And those who are supposed to back him up – the United States, the Quartet, the Arab states and Israel – consider him to be a weak leader who makes a lot of mistakes. Under any other circumstances, Abbas would have resigned his post. But now, his aides maintain, this possibility does not exist, since it would mean relinquishing all power in the Palestinian Authority to Hamas. His associates say that as a leader with a sense of national responsibility, he cannot quit. The current crisis began over the simple question of who would head the Fatah Central Committee session. Following Yasser Arafat’s death, it was decided that Kaddoumi would be Fatah’s secretary-general, and during a previous session in Amman, three months ago, Abbas agreed that Kaddoumi could run the meetings. But that angered people close to Abbas, who demanded that he not give in this time. This is about a lot more than protocol. It is about a bitter struggle for power: Kaddoumi and two other members of the central committee, Ahmed Ghnayem and Mohammad Jihad, are veteran opponents of the peace process and the Oslo Accords, and refuse to come to the territories. Abbas had asked Kaddoumi and his two colleagues to return, at least to the Gaza Strip, which Israel evacuated. However, they have refused, arguing that the Israeli occupation of Gaza is still not over. Moreover, Abbas was informed that Kaddoumi had visited Damascus and met there with Meshal about how to include Hamas in the PLO and what positions Hamas leaders would receive in the Palestinian national leadership. Both Kaddoumi and Meshal believe that the Palestinian leadership should not be based in the territories, since there, it is at Israel’s mercy. Abbas and his supporters maintain that the leadership in the territories enjoys more freedom of action than has been granted to Palestinian politicians by the Syrian regime in Damascus. One serious problem for Abbas is that veteran members of the Fatah Central Committee do not fully support him. Some clashed with him during the period when there was friction between him and Arafat; others have personal gripes against him. In an effort to counter this problem, Abbas developed ties with younger members, such as Mohammad Dahlan and Jibril Rajoub, and he is pressing to add 21 younger members to the central committee, whose 15 current members are in their seventies and refuse to allow any changes. This mess is having a negative effect on Abbas’ ability to deal with both the Hamas government in Gaza and the Hamas leadership in Damascus. Despite backing from Jordan and Egypt, Abbas has been unable to convince Hamas even to accept the Arab peace initiative, which calls for recognition of Israel in return for a withdrawal to the 1967 lines. The question now is whether Abbas has the strength to announce the dissolution of the Hamas government, thereby risking the possibility of civil war. Steve, Sorry about not commenting on this post right now. I have a video from youtube called Judiaism VS Zionism. I would very much like to get your opinion on it. I am going to post it for I do believe that it might help get a better understanding between the Jews and Muslims. I am just now going to post it. If you get time please look at it and give me your honest opinion. It is about an hour long. Thank you. Just wanted you to know that I decided to take it off. I don’t want something that may cause more trouble than good on the site. Thanks for your opinion from watching part of it. You can delete this if you want, just letting you know what I decided. Thanks Chet… I think that was a wise decision. The video that appears there now about ‘What is Islam’ is absolutely brilliant. I will post it here on my site later today. The other one, the deleted one was not bad, I just don’t trust the motives of the producers.